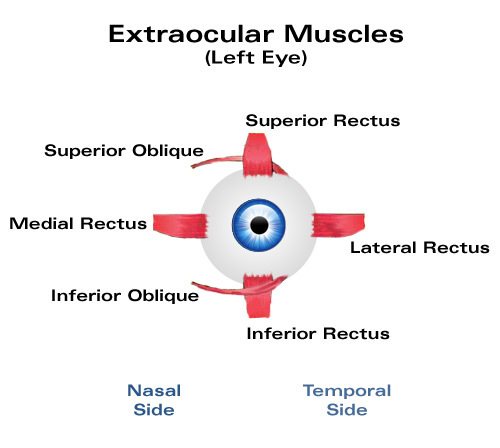 In addition to movement and tracking, extraocular muscles maintain alignment between the eyes. When the eyes are properly aligned, the brain is able to fuse the disparate images received by each eye into a single image. If any of the extraocular muscles are stronger or weaker than they should be, eye alignment can be affected making fusion difficult or impossible. Difficulty with fusion can cause double vision, also known as diplopia, or can cause the brain to "turn off" one image in an effort to eliminate diplopia. The latter is a condition known as suppression. When the eye has a tendency to turn from its normal position (such as when the patient is tired), it is called a phoria. When the eye has a definite or obvious turning from its normal position, it is called a tropia. Phorias and tropias are further described by the direction of the turning: exo meaning outward or in a temporal direction (e.g. exotropia); eso meaning inward or in a nasal direction (e.g. esotropia); hyper meaning upward (e.g. hyperphoria); and hypo meaning downward (e.g. hypophoria).